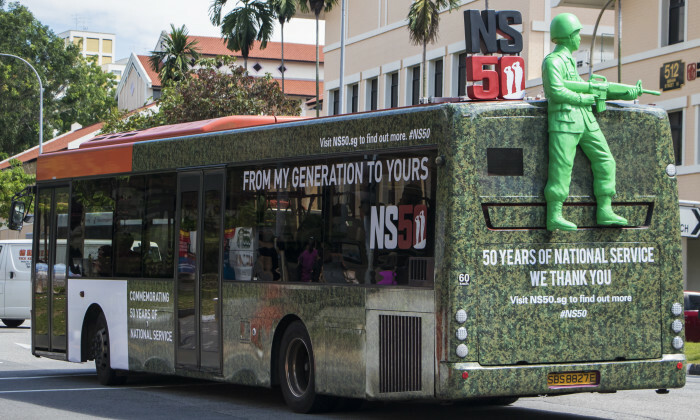 To honour Singapore’s national servicemen, 50 NS-themed buses will be travelling island-wide, including Bishan, Clementi and Shenton Way. The buses will either be wrapped in the pixelised patterns of the Singapore Armed Forces (SAF) uniforms or in designs that represent Home Team national servicemen. Of these, 25 single decks will have a 1.8m tall “mobilisation man” installed on the back of bus. The “mobilisation man” is an icon, closely associated with Operationally Ready NSmen. The “mobilisation man” bus ads for the NS50 campaign will run until 27 August 2017. The National Service Affairs Department (NSAD) at MINDEF initially appointed a consortium led by Singapore creative agency Formul8 to manage the integrated campaign commemorating National Service’s jubilee 50th anniversary this year. The consortium comprises Formul8, communications advisory firm Black Dot, social and digital agency Type A, together with media agency Maxus Global, research agency Kantar Milward Brown and events planner Ignite. Together, the consortium will oversee the full spectrum of NS50 creative and communications aspects, including content conceptualisation, public relations, marketing and online activation. As we step into the final weeks of 2014, we would like to thank all of our readers and partners for your continued support through..